The company J. Brands SARL (hereafter called J. Brands), owner of the web-site www.coastsociety.com, is registered with the Monaco Trade and Companies registry under the number RCS 14S06377. Postal address 11 Avenue Saint-Michel, 98000 Monaco and email address concierge@coastsociety.com. The purchase of any Product offered on the www.coastsociety.com website (hereafter known as the “Site”) shall be subject to these General Terms and Conditions of sale for the Site (“Terms and Conditions of Sale”). The order confirmation “CLIC” implies full knowledge and acceptance of these General Terms and Conditions and has the value of electronic signature. These General Terms and Conditions shall define the rights and obligations of the parties for any online sale of products offered by J. Brands to its customers. Our products are offered as they appear in our site www.coastsociety.com and in the limits of the stocks available. At any time, even after the order confirmation (ex art. 4), if the product is not available in stock we will inform you by e-mail and your order will be automatically canceled, no charges will be invoiced. J. Brands reserves the right to refuse orders of more than 10 products of the same model (although in different sizes). You can place your orders on www.coastsociety.com following all the steps indicated here after. 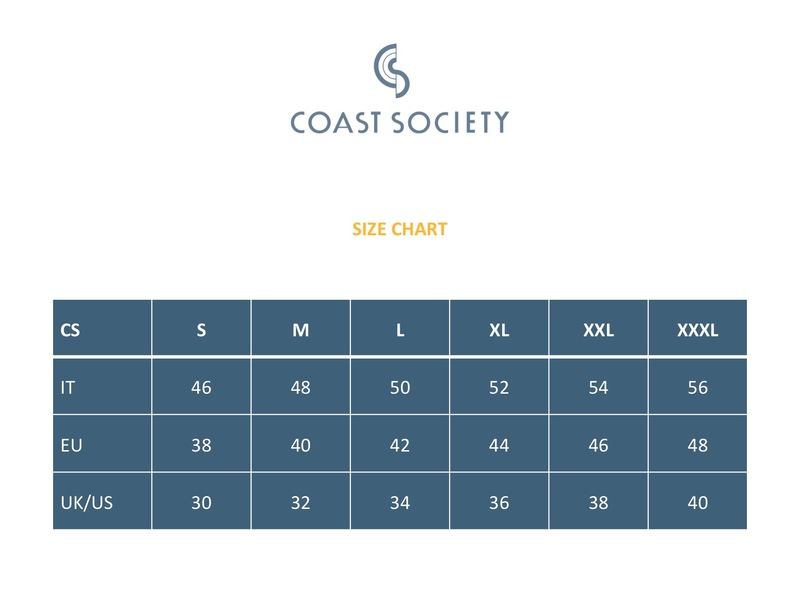 All the orders placed on www.coastsociety.com require the acceptance of these General Terms and Conditions of Sale. After the order is placed, J. Brands will send to the Customer by e-mail an order confirmation to the address specified by the Customer in the order. This confirmation will contain a summary of the order, the delivery time of the product and these General Terms and Conditions of Sale. All order confirmations require your full and complete acceptance to these General Terms and Conditions without exceptions. All data provided by the Customer as well as the order confirmation are valid as proof of the sale. You declare to have full knowledge of this. J. Brands reserves the right not to accept an order and therefore not to debit the Customer for any reason, particularly in case of non-availability of the products or in case of difficulties related to manage the order received. J. Brands will keep orders and invoices on a reliable and durable support, as provided by ex. Art. 1348 of French Civil Code. J. Brands data registry will be considered by the parties as proof of communications, orders, payments and transfers occurred between the parties. The prices of our products are shown in euros, including VAT, but not including shipping costs. All orders, whatever their origin is and place of delivery, are payable only in Euros. In case of an order with delivery in a country other than Monaco, you are the importer of these products and therefore you shall be required to pay customs duties or other local import taxes. J. Brands is not responsible for the payment of those duties and taxes. J. Brands reserves the rights to amend the prices at any time, but the product will always be invoiced at the price posted at the time of the order confirmation, subject to stock availability. The Products ordered remain the property of J. Brands until full payment for the Products. The confirmation of the order by J. Brands involves the rise of your obligation to pay the price shown in the basket. The payment of your purchase shall be made by credit card or through the Paypal system. Your account will be charged at the time of the order confirmation. The Products will be shipped within 3 business days starting from the order confirmation, to the delivery address specified when placing your order. In case of any delay during deliveries you will receive an e-mail informing you of the delay. In the event of failure to respect the delivery time, you can cancel the order by e-mail according to these General Terms and Conditions, Article L 138-2 of the French Consumer Code. If in the meantime you have received the product, you can return it at our expenses and we will proceed to the reimbursement under the conditions laid down in Article L 138-3 of the French Consumer Code. In case of delivery via a carrier, J. Brands will not be responsible for the delay due to the lack of availability of the customer or if the customer rejects the delivery, in the event of force majeure or in case of strikes. You have a legal right of withdrawal of your orders, which you may exercise under the conditions provided in Articles L121-21, L121-21-1 and L121-21-2 of the French Consumer Code. In accordance with the law, you will be able to withdraw within 14 days from the date of delivery of the Products, without having to provide reasons and without having to pay any penalties. Beyond this time, you will no longer be able to exercise your right of withdrawal. The products should be returned to J. Brands in their original conditions, complete and intact (including accessories, labels and packaging). All damages to the product will prevent the exercise of your right of withdrawal. The products should be returned to COAST SOCIETY c/o DSL Logistics, 16 Chemin de la Glacière, 06200 Nice. The costs of returning a product are at your charge. When requesting a refund, such refund will be issued in compliance with the legislation within fourteen (14) days from the receipt of the product. The refund will then be issued via the same payment method used for the order. Please note that your bank may take longer to process the refund. – supply of goods that have been opened and used by the customer after delivery and that can not be returned for hygiene and sanitary reasons. In the event that a product does not correspond to the customer needs, it may be exchanged with another product if available in stock. To return a product you must submit your exchange request by e-mail to the address concierge@coastsociety.com within 7 days from the date of delivery; J. Brands will confirm the availability of the new product and the delivery time. – in the same state in which you have received them including accessories, labels and packaging, and in perfect conditions. In the event of a product exchange, J. Brands will support the transport costs of the new product chosen by the customer; however, the customer will support the cost of first product returning. The provisions of this Article shall not prevent the consumer from exercising the right of withdrawal under Article 9 of these General Terms and Conditions. Promotional codes cannot be used simultaneously with other offers or reductions, including sales or other types of promotions. The sum or the percentage of reduction will be deducted from the total order excluding shipping costs. J. Brands reserves the right, in its sole discretion, to refuse the use of a specific promotional code by a particular customer. J. Brands decision will be final and conclusive. Shipping costs for a standard delivery in Europe is free of charge for all orders above 250 € VAT included. All the products sold by J. Brands are subject to the terms of legal guarantees laid down in Articles L 211-1 to L 212-1 of the French Consumer Code, as well as in Articles 1641 to 1648 of the Civil Code. In the event of non-compliance or latent defect of a product sold, the product can be changed or refunded. All claims, exchange requests or refund must be requested by e-mail to the address concierge@coastsociety.com and within 14 days from the delivery date of the product. The product must be returned in the same conditions in which you received it including accessories, labels and packaging. The return of the product will be managed by J. Brands at his charge. – The exchange of the product with another product (of the same model and the same size), the cost of delivery of the exchanged product will be owed by J. Brands . – The reimbursement of the product, the cost of delivery of the defective product will be reimbursed based on the invoiced amount. The terms of this article do not prevent you from exercising the right of withdrawal in accordance with Article 9 of these General Terms and Conditions. All the products offered by J. Brands comply with French regulation. J. Brands is not responsible in case of non-compliance with the legislation of the country where the product is delivered. It is the responsibility of the customer to verify with the local authorities the ability to import and / or use the products ordered. J. Brands will not be liable for damages resulting from improper use of the purchased products. J. Brands will not be liable for any inconvenience or damage caused by using the online platform, in particular not be liable for breach of service, external intrusion or computer viruses. The parties shall be considered in default of contractual obligations if their execution was delayed or prevented by unforeseeable circumstances or force majeure. It is considered a force majeure event or unforeseeable circumstance an unavoidable accident, beyond the control of the parties, independent of their will and that cannot be avoided by the parties themselves despite all efforts. The party that is touched by such circumstances shall notify the other Party within 10 days following the event and the order will be automatically canceled. These General Terms and Conditions of Use shall be governed by and construed in accordance with French law. In the event of dispute the Monegasque court will have exclusive jurisdiction. These Terms and Conditions of Use are drafted in English. In the event of a discrepancy between the General Terms and Conditions of Use in English and the Terms and Conditions of Use in French, the latter shall prevail. All materials featured on the www.coastsociety.com website (drawings, designs, models, illustrations, images, sound tracks, texts, logos, trademarks…) are the exclusive property of J. Brands. You may not reproduce, by any means or process, totally or in part, distribute, publish, transmit, create derivative works based on, modify or sell any such materials contained on the www.coastsociety.com website if not authorized in written form by J. Brands. In accordance with French law January 6, 1978, you will have the right to access, modify your personal data directly on the website.